Home builders sometimes go a little crazy, creating gabled roofs with dozens of different pitches (slopes), dormers, eaves and other doodads that make modeling them in Google SketchUp a nightmare. You can approach the construction of a gabled roof in Google SketchUp in a bunch of ways (every SketchUp expert has her favorite), but one method in particular works well consistently. Make a group out of your whole building before you start modeling the roof. Use the Line tool to create an outline of the parts of your roof that will have eaves of the same height. The goal is a single face that you can offset. A lot of buildings have complex roofs with eaves of all different heights; for the sake of this step, just create a face which, when offset, will create roof overhangs in the right places. Use the Offset tool to create an overhanging face. Erase the edges of your original face. A quick way to do this (with the Select tool) is to double-click inside your first face or press Delete to erase everything that’s selected. Push/pull your overhanging roof face to create a thick fascia. Different roofs have fasciae of different thicknesses; if you don’t know yours, just take your best guess. 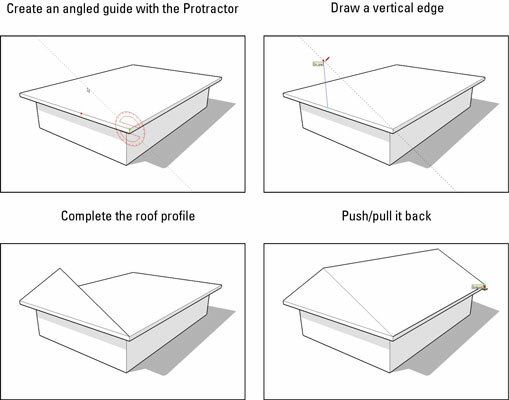 Use the Protractor tool to create an angled guide at the corner of your roof. Architects and builders often express angles as rise over run ratios. For example, a 4:12 (pronounced 4 in 12) roof slope rises 4 feet for every 12 feet it runs — a 1:12 slope is very shallow, and a 12:12 slope is very steep. When using the Protractor tool, SketchUp’s Measurements box understands angles expressed as ratios as well as those expressed in degrees. Use the Line tool to draw a vertical edge from the midpoint of your roof to the angled guide you created in Step 2. Draw two edges from the top of your vertical line to the corners of your roof. Erase the vertical edge you drew in Step 3 and the guide you drew in Step 2. Push/pull back your triangular gable. Finish your eaves, fascia, soffit, and rake(s) however you want.